Pilates is a method of exercise originating from the work of Joseph Pilates, which in his time he called Contrology. He said, "It is the mind which builds the body." Evidenced by his complete exercise method teaching awareness and control, focused breath work and postural work. Pilates builds your body's core strength, improves flexibility, balance and stamina through a series of low impact conditioning and stretching exercises. As all movements are controlled and low impact there is little stress placed on the body . It therefore avoids the muscle and joint damage associated with other types of exercise. 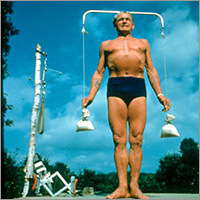 Remember, "It is the mind which builds the body"
Pilates is not just another exercise system. Pilates' principles and fundamentals carry over into every day life and other sporting activities and they will improve your quality of movement and well being. Physiotherapists, osteopaths and doctors are now recommending the holistic approach of Pilates as one of the safest forms of exercise today. Pilates is suitable for everyone, from teens right into the 90s, from couch potatoes to elite athletes. If you are a professional athlete looking to improve performance and function, someone wanting to alleviate pain or you are simply looking to achieve a healthier level of fitness then consider Pilates allowing your mind and body to work in harmony. The best way to get started in Pilates is to join a beginners class with a qualified Pilates teacher. Classes are held in most towns in studios equipped with specialist exercise equipment or in village halls and sports centres where matwork often takes precedence. The Real People Pilates DVD's will enable you to work out at home, providing safe functional and effective exercise routines. The DVD's are an excellent compliment to any exercise program. We recommend that you only train with a fully qualified teacher who is a member of a recognised Pilates training association. Pilates training takes years and is an ongoing process with committed teachers continuing their studies and taking workshops to help bring about further benefits. Please be aware that some classes taught at sports centres and other places could be led by instructors who may have only experienced minimal training. Never shy away from asking about a teachers qualifications and current membership status. It's your body that is at risk. You should always seek professional medical advice before undertaking any new exercise programme.